The first thing most stoners do when they wake up in the morning is pack a bowl of weed. The wake and bake is a past time enjoyed by millions of people all over the globe each morning. If you are still caught up with the stigma that enjoying a bowl of weed is a crime, then you should do a google search for “The DEA plans to reclassify marijuana by July 2016.” Now that everyone is on the same page. We can all better understand how the stoners wake and bake methodology works. To understand the greatness of this wake and bake coffee mug you must understand the mind of a pothead. First, you must pack a bowl of weed to gain motivation for a task. You will enjoy the task more while high. Second, at the completion of the task, you must pack a bowl of weed to celebrate your victory in accomplishing your task. Third, If you were away from home while doing the task, you must pack a bowl of weed once you have entered your home, as you are tired from the day’s task, and you deserve to relax. The reason the “Wake And Bake” is the equivalent of zen meditation for stoners is because it sets up the day for the tasks at hand. This Wake And Bake Coffee Mug Pipe does more than just get you high. It combines the two biggest morning motivators in the world. Weed and Coffee. Stoners don’t want to rush out and fight traffic only to wait in line at a busy coffee shop for a burnt cup of coffee. They want to relax at home, under a blanket, slowly getting ready. In between packing bowls of weed, warming up by drinking a nice cup of coffee and getting the energy to back up that creative high. Do you know what goes great with the Wake And Bake Coffee Mug Pipe? Cannabis infused coffee! If you are a medical marijuana patient check out this recipe on how to infuse weed into your coffee. You can ingest your medical marijuana in two different ways with this mug! 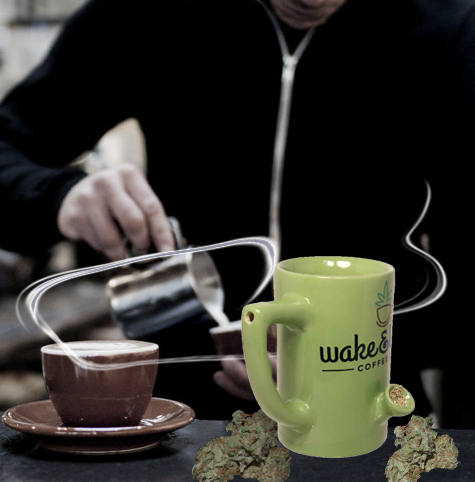 If you were looking to spoil yourself or if you were looking for that gift idea for the stoner in your life, than the Wake And Bake Coffee Mug Pipe is the best gift you could possibly give.